Meet the Team Part 6 – Tiiiiiiiiiimmmmbbbbbeeeeerrrrrrrr! On most archaeological sites, the discovery of a 2,000 year old piece of wood would be a signal for everyone to stop working and crowd around, marveling at the excellent preservation. On our site, things have had to get a bit more mechanised. So far we’ve recorded almost 4,000 individual timbers, including everything from massive posts and beams, to thin fence planks and wattling. Managing this many timbers requires a lot of different skills and expertises, and luckily our team has more experience than you can shake a Roman stick at! 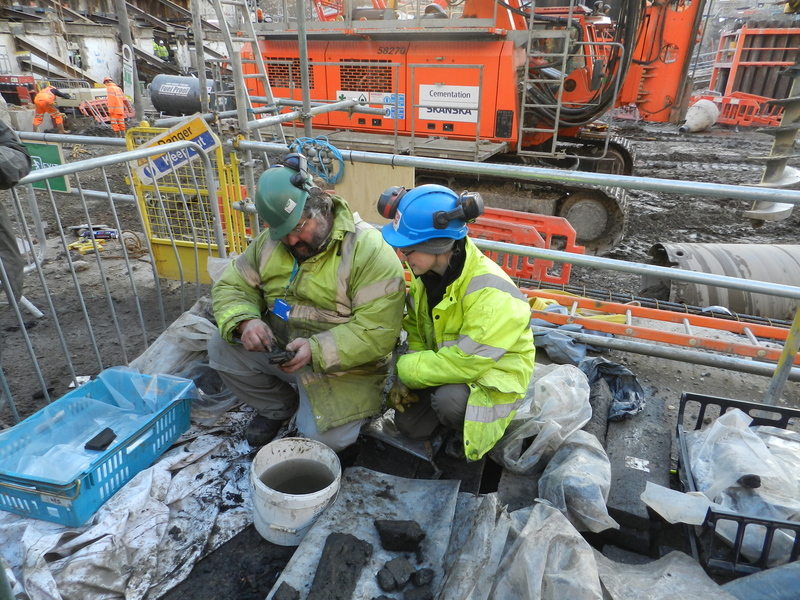 A regular face on site is Dr Damian Goodburn, MOLA’s resident timber expert. He’s been working with MOLA for 33 years since completing his first degree, but like all Freudian obsessions his interest in timber started in childhood. Damian spent his youth working with waterfront carpenters, and began building boats at age of just 3. Although a PhD and decades of practical experience certainly help, Damian says that interest is the main qualification. He joined MOLA as a regular field archaeologist, but soon found that there was an important niche that needed filling; whilst wooden objects were managed by finds specialists, few archaeologists really understood what they were looking at when faced with complex structural remains, machinery parts or ship timbers. 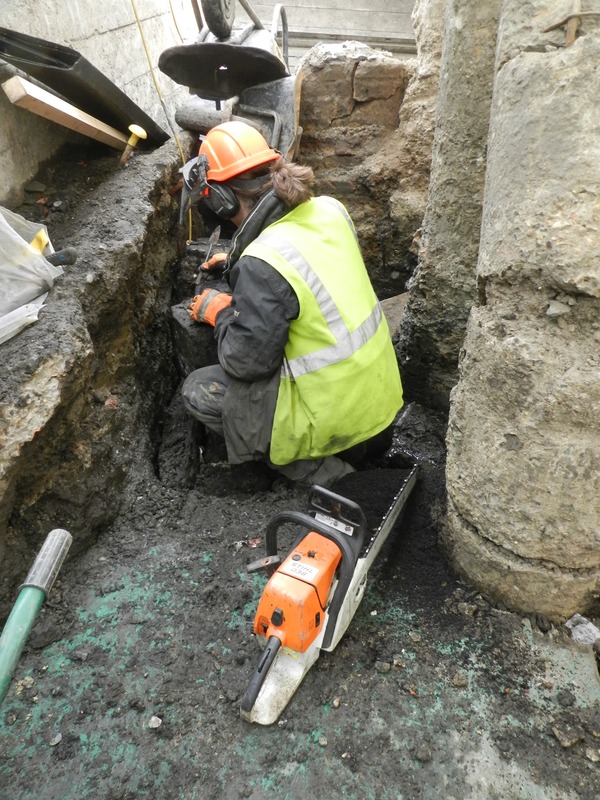 As timber expert, Damian works alongside field archaeologists and supervisors to provide on-site advice on the excavation, recording and sampling of archaeological timbers, as well as with specialists in archaeobotany and dendrochronology back in the office. He normally divides his time 50/50 between being on site, providing advice and making records, and being in the office writing up specialist reports on ancient woodworking (although this site keeps him out of the office much longer than he should be!). Another frequent visitor to site is Paul Thrale. 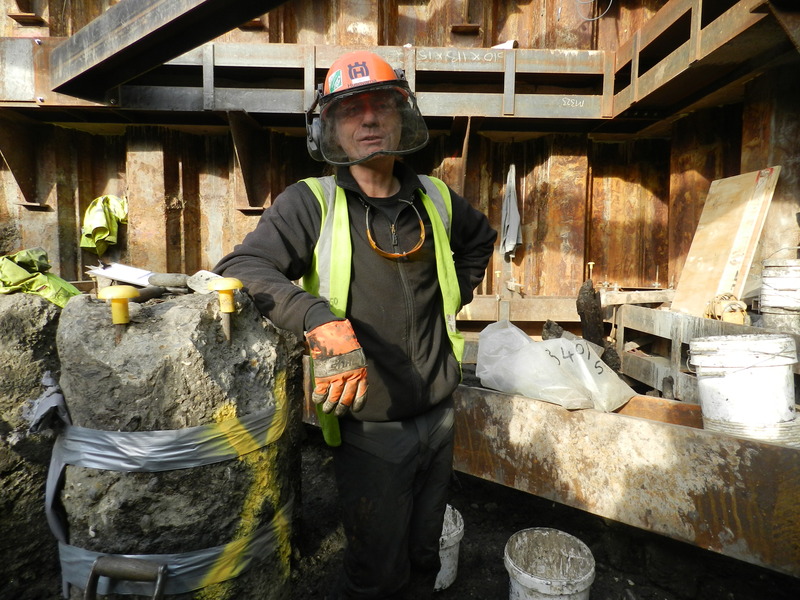 As a Senior Archaeologist, Paul runs MOLA excavations across London, and has built up particular expertise on waterfronts and East London industrial sites through 26 years of dedicated service. This means that Paul knows his way around timbers, and he often helps other Senior Archaeologists to set up timber recording strategies on new excavations. Paul is also one of three people working for MOLA who is a qualified chainsaw operative, and the only one with specialist knowledge of archaeological timbers. 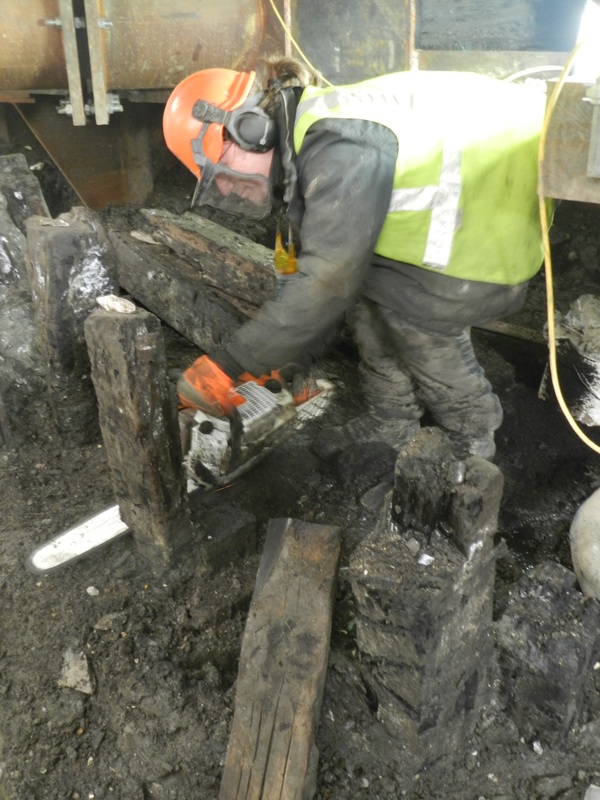 He is often called in to cut up large timbers so that they can be removed from site, to cut down tall posts and piles that have become unsafe, and to cut timbers for dendrochronological sampling. Using a chainsaw on an archaeological site is dangerous work. Space is often restricted, and the ground can be extremely slippery, so safety is paramount. Paul has a lifetime chainsaw licence, but nevertheless takes regular refresher courses in their use and maintenance every few years. He also has first aid training and wears a considerable amount of extra protective clothing including a metal visor, reinforced gloves, and trousers and boots containing leather and Kevlar. Day-to-day implementation of Damian and Paul’s strategies falls to our Timber Co-ordinator, Victoria. 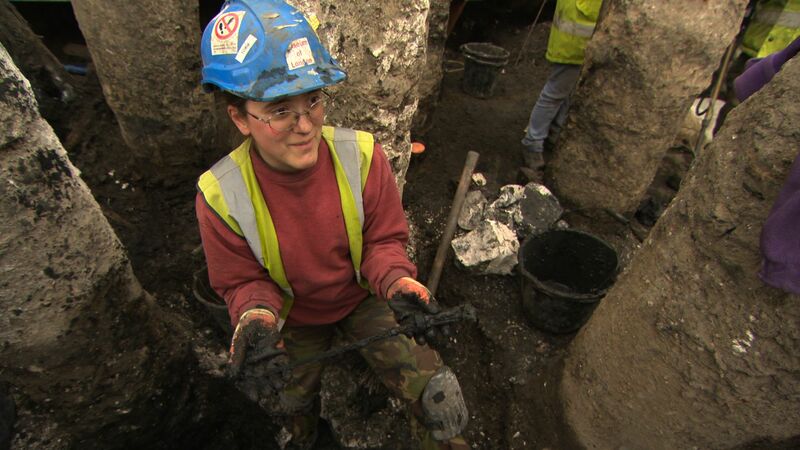 Toria is another misplaced medievalist, having worked in commercial archaeology for four years since gaining her Masters in Medieval History. 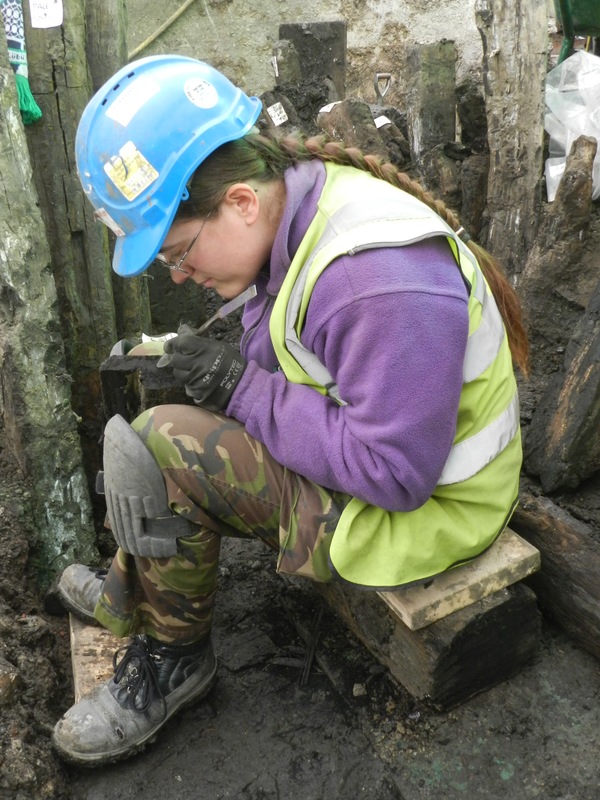 Before coming to this site Toria spent six months working on the waterfront site of Three Quays, where she spent most of her time recording timbers and picking Paul’s brain. When we decided that someone needed to be in charge of the mountains of wood and paperwork that were building up, she seemed to be the obvious choice. As well as making sure that the site’s recording and sampling strategies are implemented, Toria is on hand to answer questions and run seminars to make sure that everyone knows what they’re doing and what they’re looking at. She manages the timber-related paperwork, looks after the tools, takes samples, and makes sure that everything is available in order for Paul and Damian to make the most of their visits. If she’s very good and gets the backlog cleared away, we even let her out to do some digging. All of this means that at the end of play we will have a complete archive of fully recorded, dateable timbers, bringing with them a wealth of new questions. After all, wood was the most common material for making things in the past, and yet is also the least well preserved. On sites like ours, there’s always going to be something new to learn!